It was one of the most searing images of the war in Iraq: a tiny girl, splattered in blood and screaming in horror after her parents had been shot and killed by American soldiers who fired on the family car when it failed to yield for a foot patrol in the northern town of Tal Afar. 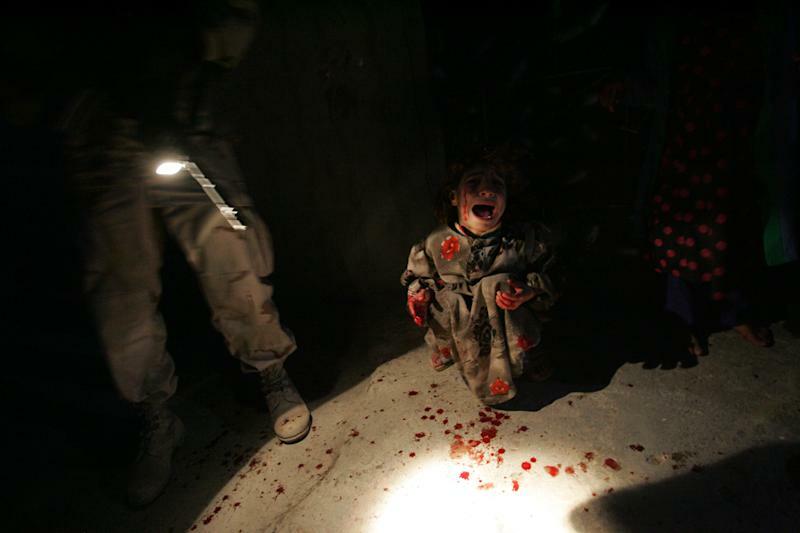 Taken by Getty Images photographer Chris Hondros, who was embedded with the patrol, the January 2005 photo offered powerful visual testimony to the horrific impact of the conflict on Iraqi citizens. It came as the American public was beginning to question the rising death toll and purpose of a war that was starting to look unwinnable. Hondros was inured to the chaos of war. By then, he was a veteran combat photographer who had served as a witness for the world on the front lines of conflicts in faraway places like Afghanistan, Pakistan, Liberia and Sierra Leone. But Hondros wasn’t merely fueled by the adrenaline of covering war. He was there to document the impact of conflict on people, both soldiers and civilians, to discover something deeper about humanity through war. So it was a horrible and painful twist of fate that a photographer so determined to show the world the human impact of conflict died trying to do just that. Hondros was killed in a mortar attack along with fellow photojournalist Tim Hetherington in April 2011 while covering the war in Libya. He left behind an adoring mother, a fiancee and a tight-knit group of friends and colleagues who were devastated by his death but also determined to preserve his memory and legacy as one of the most promising photojournalists of a generation who died too soon. It’s that career that is the subject of “Testament,” a new book of Hondros’ work published by powerHouse Books and Getty Images (which is donating its portion of the proceeds to the Chris Hondros Fund). The book, edited by Ciric and Pancho Bernasconi of Getty Images and Christina Piaia, Hondros’ fiancee, features not only images that Hondros took over more than a decade of covering conflict, but also his own words, taken from stories and essays he wrote about his experiences on the road as he sought to understand what he was seeing through his lens. But there are also moments where Hondros steps back and marvels at the unusual situations he’s found himself in — perhaps echoing the feelings of soldiers far away from home in strange places. While embedded with U.S. troops in remote Afghanistan in late 2009, Hondros wrote of losing his footing and sliding “like a water slide” down a precarious mountain while he was trailing soldiers ferreting out caves used by the Taliban. “Why am I here? How did this happen? Why am I hanging on the side of an Afghan mountain? I’m not in the Army; I didn’t sign up for this. I should be back home, watching TV or canoodling in bed or having an espresso,” Hondros wrote. But, he added, “The satisfaction of photographing our era’s most important issues far outweighs any discomfort, or even fear." The book was truly a labor of love from three of the people closest to Hondros. The idea was born soon after his death in 2011, but it took more than a year for the three to be in the right frame of mind to tackle such an emotional project on behalf of someone they loved so much. The first step was going through Hondros’ massive archive of photos — hundreds of thousands of images, including some stored on hard drives so old the cords they used to connect to a computer or a power source had long been outdated. Friends in the photojournalism community searched through drawers, finding old cords and cables that were used to fire up the old drives. What they found, according to Ciric, was a “treasure trove” of photographs — including many they had never seen before. Suddenly, their search — while still emotionally exhausting — was a doorway into Hondros’ world, his process and his vision in often precarious situations. Photos that Ciric and her colleagues at Getty were so intimately familiar with were suddenly supplemented by the outtakes that Hondros didn’t file, including the occasional image of the photographer himself captured in mirrors as he documented his subjects. The three spent months deciding which photos to use in the book — often running their ideas past other friends and colleagues. They tried to balance what they believed Hondros would have most wanted with the goal of compiling a book that would best define his entire body of work. While there are no chapter titles, the photos were informally grouped into a flow inspired by the movements of a symphony — a detail that was another nod to Hondros, a classical music lover who used to present slideshows of his work accompanied by a soundtrack of Bach. The book devotes space to themes that were important to Hondros — including portraits of children he photographed in war zones. That includes the startling images of that terrible night in Tal Afar nine years ago — which not only changed the perception of the Iraq War but had a powerful personal impact on Hondros. Ciric recalled receiving a phone call from Hondros after he had filed his photos from Tal Afar. It was the middle of the night in Iraq, and Hondros was still trying to work through what he’d seen. He knew he’d likely be kicked out of his military embed for publishing the photos. But he was more concerned about the young girl and her five siblings who had emerged from the bullet-riddled car that night, bloodied and orphaned in a terrible instant. In the end, Hondros helped more than he thought. His photos from Tal Afar were published worldwide, spurring fundraising for the family and prompting the Pentagon to reassess what had been its liberal rules of engagement in Iraq. Hondros was even summoned to speak to Paul Wolfowitz, a top Defense aide to President George W. Bush who was considered a key architect of the Iraq war, who questioned him about his experiences in the field. By then he’d been expelled from the embed. The image of that little girl, later identified as Samar Hassan, has come to be considered one of the most important images in conflict photography — frequently likened to Associated Press photographer Nick Ut’s famous image from Vietnam of a young girl running from a napalm attack. It underscores that sometimes the most important thing you can do as a journalist is be a witness for the world — and that’s what Hondros died doing.